The upcoming ANA World’s Fair of Money will have two official auctions, one hosted by Heritage Auctions and the other by Stack’s Bowers Galleries. These two sales will feature hundreds of quality coins that will definitely bring some intense competition. Of course, there will be some that stand out above the rest because of their quality and rarity. Below we have listed a few of the rarities from these two extraordinary sales that should attract some very aggressive bidding. All of the coins listed above are extremely rare as evidenced by their current FMV or their lack of an FMV price because of past unavailability. The majority of these coins have a population of five or less in the listed grade; six of them have just one certified and three of those have none grading higher. The only exception is the 1879 $4 Gold Flowing Hair which shows a population of 28 in PR65 Cameo with 42 grading higher. Yet this coin had an original mintage of just 425 coins and all $4 Gold Stellas are considered rare. This particular coin has the CAC sticker as well. Not only are many of these coins infrequently available at auction, they may not be available again for decades, and competition between long-term collectors should be fierce. Additionally, quite a few of the true rarities in these two auctions have the CAC approval, a confidence boost that typically creates an extra premium, and will no doubt lead to advances in FMV. Identifying extremely rare coins may not be all that difficult. Mintage totals and population reports are important tools used by collectors to determine rarity. The problem is that these extremely rare coins are not always available and, as we have seen in past major auctions, when an extreme rarity does hit the market, competition usually drives prices to extreme levels. 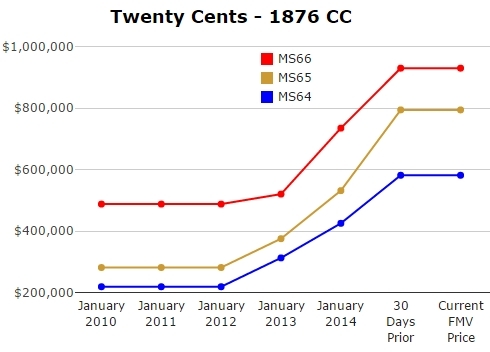 Graphed below is the recent price history for the 1876 CC Twenty Cent in the upper most grades of MS64, MS65 and MS66. 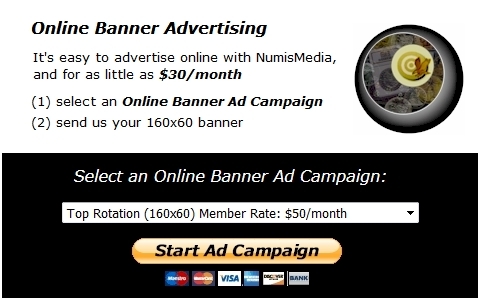 While there may not be one in the two upcoming major sales, it is a coin that always attracts specialty buyers and is a good example of a coin that is not frequently available. From the beginning of 2012 through today, there has been a steady increase in the FMV for all three grades. The 1876 CC Twenty Cent is extremely rare with just 10,000 coins minted, but most of them were melted and never released. Between PCGS and NGC, there are only 23 coins certified in all grades. There are eight in MS64, seven in MS65, and only two in MS66, both by PCGS. Since the beginning of 2009, only three Mint State coins have traded in auctions according to CoinPlex: an MS66 sold in a Heritage Auction in 2009 for $460,000, an MS64 sold in a Heritage Auction in 2014 for $470,000, and an MS65 sold by Stack’s Bowers Galleries in 2013 for $564,000. The values in these ultimate grades have continued to rise over the last few years primarily due to private sales or offers to purchase. This is another rarity that does not come along very often, and when it does there should be a whole lot of competition, especially since it is from the Carson City Mint which has a strong collector base.